Practice with me anywhere in the world! The Skype Sessions are an offering to anyone interested in developing their practice with a personal service from the comfort and privacy of your own space and at your own pace. It´s kind of like an interactive yoga video – you will be guided through a uniquely crafted sequence but will be able to pause and ask questions as you go enabling you to get the most out of your practice. Oh the wonders of digital technologies eh? 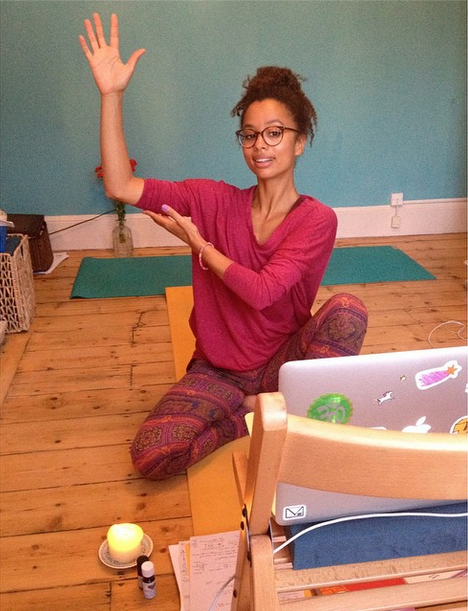 Q: HOW CAN THE SKYPE YOGA SESSIONS BENEFIT ME? You have limitations in reaching public classes and need a convenient way to practice at a time that works for you. You want to develop your practice in the privacy of your own space with a programme that is designed considering your needs and requirements. You want to continue your yoga journey with support in your development at your own pace. “ Thanks SO much for your time and for the opportunity to test your new service. I feel really fantastic now , and you gave me a lot of food for developing my home practice. I found the questionnaire very helpful to think and formulate what I was looking for: it was a great way to check in with myself and think about what I was looking for. I enjoyed that you took the time to check in with me before the session, and to make sure we were on the same page :-). Also it was a good idea to ask whether I wanted demos or not – I hadn’t thought about it. Q: SOUND GOOD, BUT WHAT DO I NEED? A: It´s simple, you just need a computer with video and sound capability, access to the internet and Skype, a free, downloadable programme that enables you to videochat for free with anyone anywhere who also has Skype! Q: GOT THAT – HOW CAN I FIND OUT MORE AND GET GOING? A: There are limited places available so if you´re interested, email me for an information pack with all the details and we can get the ball rolling. I will send you a questionnaire if you choose to proceed and the rest is down to you – we can get started as soon as you like. This entry was posted in health, inspiration, lifestyle, news, schedule, sequence, workshops & events and tagged beginners yoga, home practice, inspiration, private yoga, skype yoga, yoga, yoga anywhere, yoga at home, Yoga Everywhere, yoga pose, yoga sequence, yoga with dionne. Bookmark the permalink.